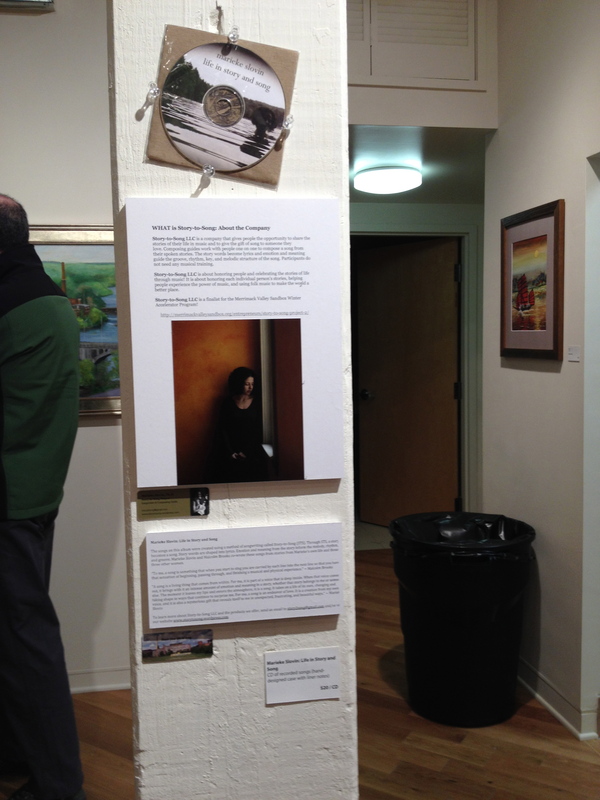 Last night, I performed at an exhibit opening at the Arts League of Lowell. 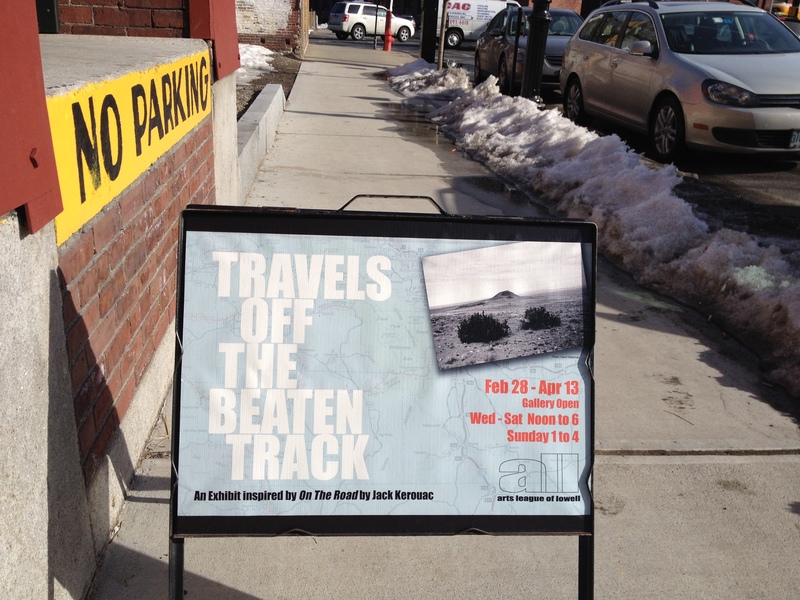 I had submitted my first recorded album for an exhibit honoring the life of Kerouac called “Travels off the Beaten Track.” I knew that David Amram would be playing earlier in the gallery opening, but I got the go ahead to bring my ukulele and equipment just in case. I have pretty much been operating by the notion that any potential for performance is worth pursuing. Getting up on stage helps me build confidence, share the songs I have written, which are folks songs that honor people and their lived experiences and are meant to be heard, and continue to try to make a name for myself among the millions of musicians out there in the world. I had been working all day and did not get to the opening until 6:30pm. Amram and his accompanists were just beginning to break down. I asked around and people suggested I try to get a sense from the crowd if another set might be desirable. So, I put my Sandbox social skills to work and proceeded to chat it up with the gallery goers. “You are not actually going to play a ukulele?” an older gentleman asked when I informed him that it was a ukulele and not a violin in my instrument case. “I sure am,” I responded with confidence (I figure that the more I speak with confidence, the more it might actually take root). “Ten minutes,” I responded. Now, I knew that I had to find a way to force myself onto a stage. But the musicians were chatting with folks. There did not appear to be much activity going on in the “breaking down” department. As I was getting my equipment out and ready, another fellow came over and insisted that I should be playing a song about Honolulu. I told him it did not seem quite appropriate to a Kerouac exhibit opening. Another person asked where I was going to play. “Well,” I said. “All I really need is an outlet, and I can make my own stage.” So we each set out to find an outlet where I could set up. And so it went, and I learned a valuable lesson. When there is not stage, make your own. I set up, plugged in, and introduced myself to the people in the room. They could have gone on chatting or made for a hasty exit, but they stayed. And I played a set. I began with a song from a woman’s story about her passion and connection with Kerouac through the writings in his book Visions of Gerard and continued with the songs of factory workers in Lowell. The gentleman who was concerned about the ukulele not being a violin carried on a conversation with me between songs from his seat in the audience. He told me I reminded him first of Linda Ronstadt (was that I compliment? I wasn’t sure) and then of Joan Baez (definitely a compliment) and of a pair of sisters called McGarrigle? He wanted to know about how I wrote the songs. Everyone laughed, but the joke was lost to me. I continued by saying that I work one-on-one with people to write songs from their stories. Later, a friend told me that I had the line “for hire” is typically used by prostitutes. Definitely not my intention or one of the suite of products I offer; but also a good lesson in what not to say when talking about my business. Despite announcing that I was a songwriter “for hire,” people were engaged and quiet as I performed and wanted to talk and ask questions at the end. I was told that it was not only my voice and songs that were engaging but also my presence. I was asked if my songwriting was inspired by a life of oppression. David Amram, who had stayed for the performance, offered kind words in a soft voice and told me that next time he would back me up when I played. A dear friend recently reminded me of the words I spoke while writing my dissertation a year ago. What I really want to do is to be a songwriter and do Story-to-Song full-time, I had confided in her. But I have no idea how I could do that. Now, here I am with my name written on a plate of glass among other artists and my very own column in an exhibit. A year ago, I never would have believed it. I am not sure I believe it today. But despite my propensity for saying strange things, I intend to continue pursuing my passion and sharing Story-to-Songs with as many people as will listen. I highly recommend this practice for you as well. Step 2: practice your passion. Step 3: share your passion. Step 4: believe in yourself because you are great!